Now that Hot Toys are done turning as many Avengers as they can into gloriously pretty (and expensive) action figures, it’s time for them to return to Star Wars and do pretty much the same thing — and they’re back with a pretty great recreation of everyone’s favourite farmboy. You can say this about almost every Hot Toys likeness, but damn. That’s uncanny, that is. You almost half-expect to start hearing him whine about the academy and going to Tosche station. If you order from Hot Toys (or Sideshow in the US) he even comes with a Stormtrooper blaster and belt. Seriously, so many accessories! A pleasant change from some of the more lightly-accessorised figures shown as of late. 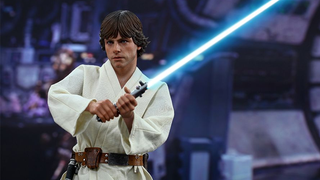 Luke is due for release in the middle of next year — you’ll be able to preorder young Skywalker on Sideshow Collectibles soonish, and you can expect the usual price of around $230 to apply to him too.